Having finally struck gold with Windows 10, Microsoft is really pushing its latest operating system by giving it away to upgrading users for absolutely nothing. With Windows 10 Microsoft has brought in a raft of new features and tweaks, meaning that no matter if you’re completely new to Windows or have upgraded from Windows 7 or 8.1, there’s plenty of new features to brush up on. And that’s why we’ve put together this list of the 15 Windows 10 tips and tricks that you really, and we mean really, need to know. Don’t fancy clicking on Cortana’s search and typing in your query? You can actually just ask Cortana a question, but to do so you first have to enable it to respond to the sound of your voice saying “Hey Cortana”. Bear in mind, you may be asked to set your microphone up to use this feature if Windows doesn’t think it’s compatible. While Quick Access is great for finding a recently or commonly used file or folder, those who just want to quickly find something on their computer might prefer the “This PC” view from Windows 7 and Windows 8. Thankfully you can switch Explorer back to how it used to be in just a couple of simple steps. 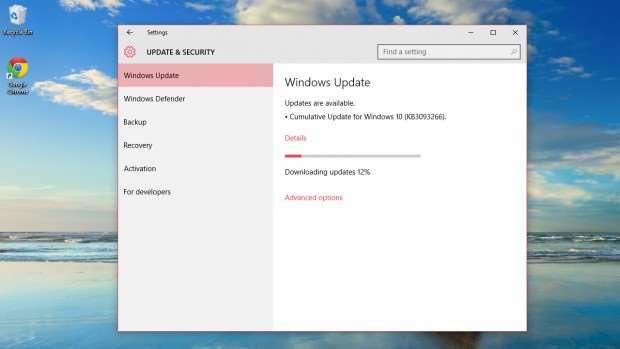 Windows 10 may remove much of the effort when it comes to updates but it also has a terrible habit of resetting your computer at the worst times. Yes, you can delay some updates if you’re running Windows 10 Pro but Home users have no choice but to succumb to Microsoft’s update will. Thankfully there’s a way to make this process a little more palatable, saving your internet bandwidth as well as your open documents in the process. However, doing so means you do still get Windows 10 updates Microsoft deems as “essential”, but you’ll stop seeing app updates and updates to Start screen tiles. Under “Metered Connection” toggle the “Set as metered connection” switch to On. Choose “Advanced Options” and then use the drop down menu to select “Notify to schedule restart” instead of “Automatic” and now you’ll be notified when Windows 10 is about to restart, so you can stop it. Microsoft’s replacement for its creaking Internet Explorer browser is definitely a welcome change, but it’s over-eager desire to open everything as the default app is not. Thankfully you can stop Windows 10 using it as default, and in the process set defaults for all your other applications. In here you can reassign defaults for a whole array of services and applications, even assigning them by the type of file they open. 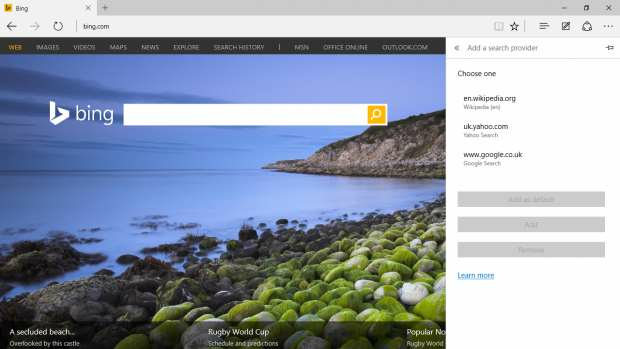 Seeing as Bing is the default search engine for Microsoft Edge and the Windows 10 search bar, it’s hard to get away from Microsoft’s search engine. However despite improvements and its best efforts to force Bing upon Windows users, Google will always reign supreme. While totally removing Bing from Windows 10 is impossible, you can kick it out of Edge and clumsily replace it in the Windows 10 search bar. Here you’ll see a list of available search engines. If the list is empty (as it tends to be) navigate to your browser of choice and repeat the process. You should now see it listed as an available provider. Now, when you perform a Windows 10 search Chrome will boot up and take you through to a Google search. Thankfully you don’t lose any standard Cortana or device search by doing this either. Windows 10 may look sleek and stylish, but when you’ve got multiple windows open its design is terrible as the active window is never really highlighted. Microsoft is aware of the issue and is working on a fix, but in the meantime you can make things easier on yourself with a subtle border surrounding your currently active window. Now Windows 10 knows more about you than ever before, it really does make sense to keep your profile behind a password or biometric lock. However, it’s endlessly annoying to boot your desktop or laptop up, walk off to do something and come back to discover it still hasn’t booted into desktop and loaded startup apps because of your lock screen. While we don’t recommend completely removing your password and security logins, it can be done with just a little bit of brute force from the Windows tweaker’s favourite tool: the command prompt. You’ll be prompted to enter and confirm your password to change the settings. Once done you’ll never have to login to your computer again! If you’ve upgraded to Windows 10 from Windows 7 or 8.1, playing DVDs is a complete cinch thanks to your video licence carrying over from the previous OS. However, if you’ve purchased a new laptop or desktop that’s running Windows 10, you’ll discover you can’t play DVDs at all! Microsoft does have a solution in the form of a Windows DVD Player app on the Windows Store for those that just have to have DVD playback functionality. The app is currently free until the 29 July 2016, but after then it’ll cost a hefty £11.59. Adobe Flash changed the face of the web. It was often slow and cumbersome – forcing you to wait for Flash-heavy sites to load – but it opened the doors to a whole new world of website design. It was exciting and fresh, for all its technological failings. Now though, Flash is a buggy, lumbering nuisance with security holes aplenty. It’s had its time in the sun. If you’d like to keep Edge browser running silky smooth and without security holes, you can turn Flash off at the flick of a switch. Open Edge and click the ellipsis (three dots) in the right corner. Windows 10 certainly likes to let you know what your apps and social feeds are doing. While this can be a really useful feature, it often becomes rather annoying to deal with when you have a lot of active apps and programmes running. Luckily Microsoft knows that not everybody wants notifications from Windows Feedback or other pre-installed apps, so it now lets you select the apps you want to hear from. Windows 7 brought us the wonder that is window snapping with Aero Snap, a feature Apple has only just rolled out with OS X El Capitan. While Windows 8 refined the feature, Windows 10 outdoes it entirely by allowing you to snap together four different windows and apps. The best bit? You can do it all with just two key presses and no fuss. Not so much a trick but more of a tip for those who hadn’t already noticed: Windows 10 finally lets you “print” documents to PDF. No more installing a third-party app to save a web page or document for use offline, now you can select PDF as a printing output option to have Windows 10 export documents into Adobe’s indispensable file format. Microsoft has introduced a new Battery Saver tool into Windows 10, helping boost your laptop or tablet’s battery life if you fall below a certain threshold. You can find Battery Saver settings through Settings > System > Battery Saver and Battery Saver Settings. In these menus you can have Windows automatically switch to battery saver mode when your charge falls under a certain threshold, disabling push notification and lowering screen brightness in the process. Rather handily, Microsoft also allows you to exempt apps, meaning they’ll run as normal regardless of your Battery Saver settings. Microsoft has, what it believes is, a handy system for sharing your home wireless network with friends. Anyone who’s in your contacts list automatically gets your Wi-Fi password, meaning when they come round to your house or office they’ll automatically connect to your network without needing to bother you with the password. While Microsoft says this is completely safe, with users unable to access networked storage or be privy to any other sensitive data, alarm bells should clearly be ringing. If you’d like to keep your home network unclogged from your friends’ Instagram feed and YouTube streaming, Microsoft does allow you to turn this functionality off via “Share network with contacts” when you first connect to a new network. However, that doesn’t stop other Windows 10 users from sharing that information when they connect to your home network. If you want to completely remove your wireless network from Windows 10’s Wi-Fi Sense scheme you actually have to rename your network’s SSID to include “_optout”, which is less than ideal. We all know our Ctrl + Alt + Del and Windows Key + D shortcuts, but with Windows 10 Microsoft has included a new set of incredibly useful keyboard shortcuts that you need to commit to memory right away.